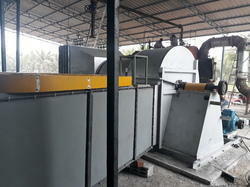 Pioneers in the industry, we offer coir pith dryer from India. Operating the plant round the year becomes possible. Plant area can be utilized more effectively and one can easily dry more than 10 Kg/m2/day. Manpower requirement can be reduced to less than 1/10th that of the manual operations and capital investment is much lesser than that required for making paved yards.